No more juggling bottles and figuring out what to take. 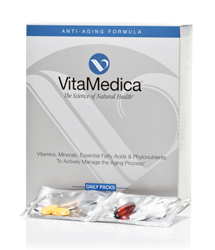 The Anti-Aging Formula Daily Packs by VitaMedica make taking your morning and evening packets convenient. The packets combine top-selling multi-vitamins, minerals, organic flax seed oil and antioxidants, making it easy and convenient to stick with a supplement routine. This supplement pack is ideal for those who lead active, busy lifestyles and need the on-the-go essential nutrients to support long-term health and wellness. The 30 dual packets are specifically formulated to promote glowing skin, strong nails, luxurious hair, bone density, joint flexibility and cardiovascular vitality. To learn more about VitaMedica, click here.